Things are moving fast round here! 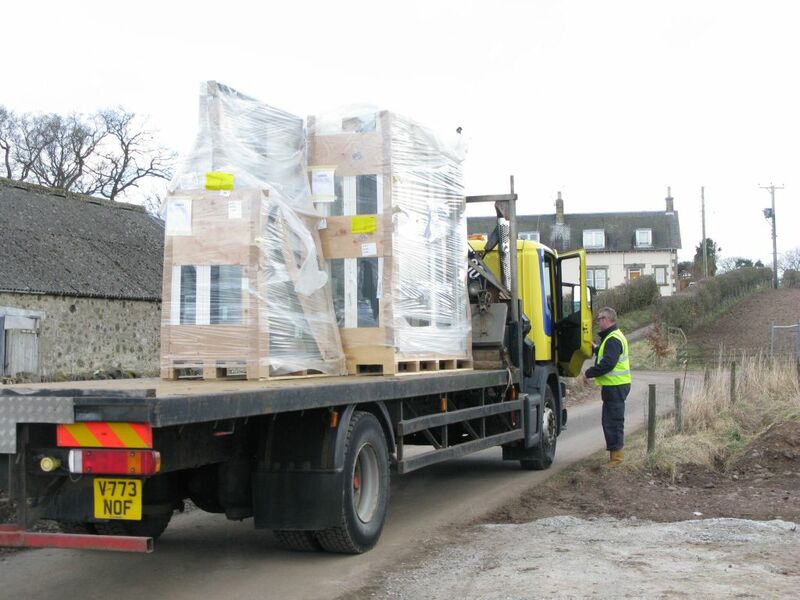 In the middle of last week the ground floor windows arrived from Denmark via Dundee. 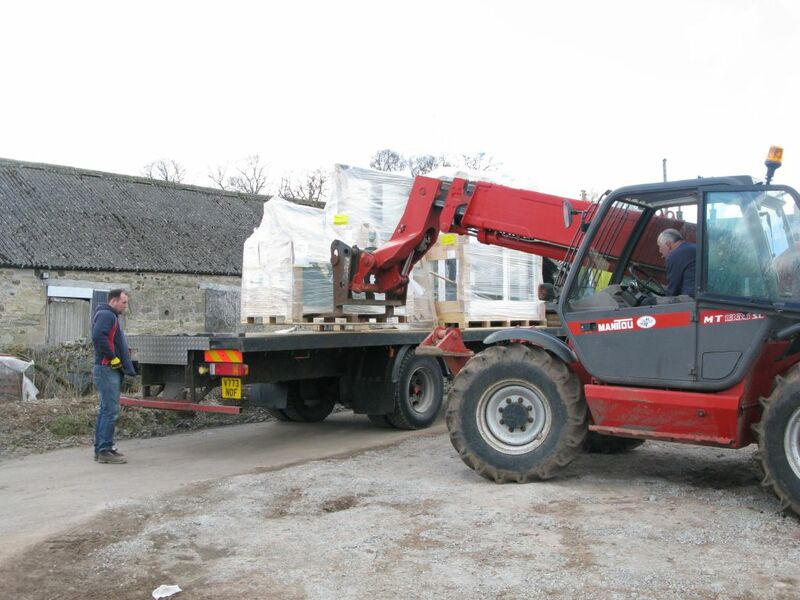 Although the load on the lorry was not the biggest we’ve seen on this project, getting all the pallets off in one piece was easily the most nerve wracking episode so far. The windows were stacked vertically on the pallets, and tied down on the wagon they were stable. But as soon as we untied them and put a forklift beneath them, they wobbled like crazy. Pete did a great job lifting them off very slowly and I think we all breathed a sigh of relief when they were all down on terra firma. Only thing left to do was install them. 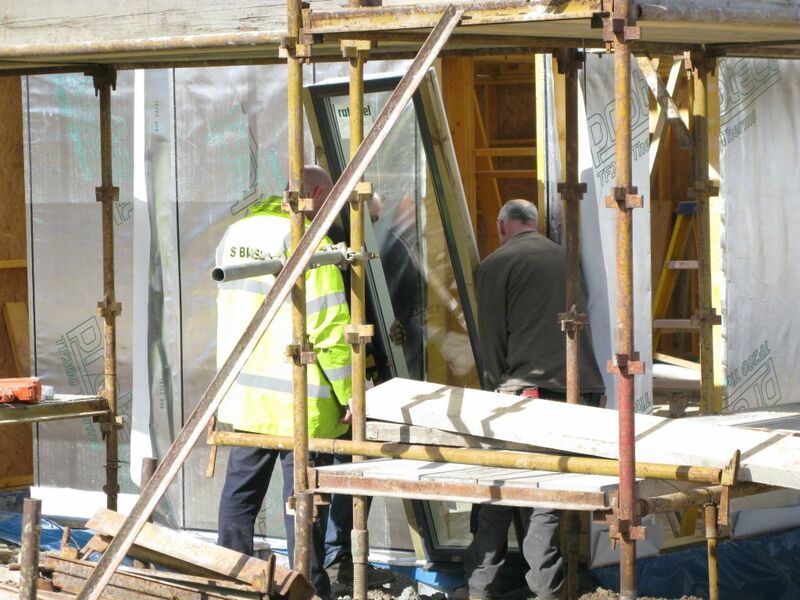 Andy had negotiated a good deal with Rationel – triple glazed for the same price as double glazed. But the real price for this was in the carrying. The full height sliding doors weighed nearly 200kg each and took 4 people to lug them into position. The smaller windows were easier but ironically, the first and smallest window was the hardest one to fit. To fit the windows Pete and Ali screwed wooden battens (firestops) to the sides of the frames, slid the frame into position and then nailed the battens to the wooden house frame. Which is all very well if the opening for the window is the right size (or the window has been sized correctly.) The first one was a squeeze for some reason, but the rest of them slid into place nice and easily, as far as 400lb windows can be slid easily. 18 windows, and a day and half’s work later, we moved onto the roof lights. 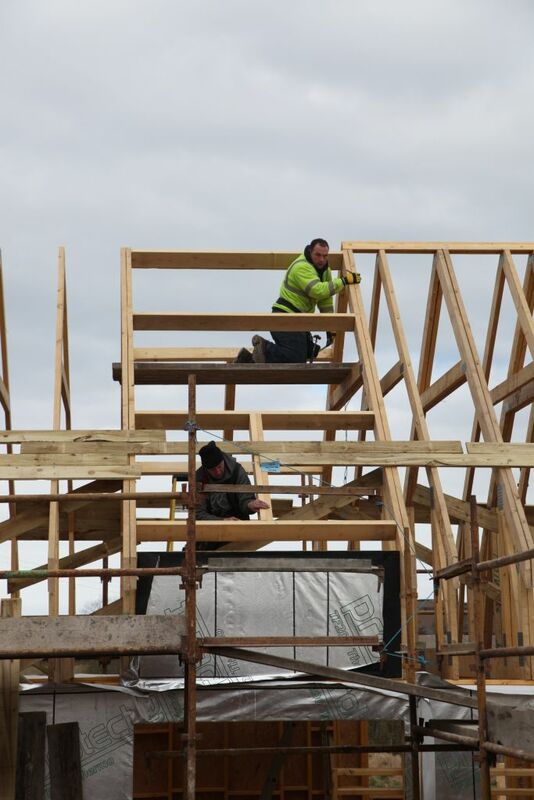 Once the roof trusses were in place, the first task was to create the openings for the roof lights to sit in. 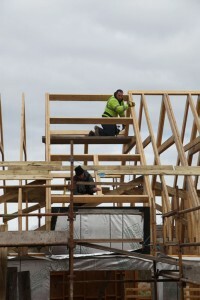 Ali and Pete perched up in the roof and hammered in the broad beams between the trusses. The roof lights themselves would have to wait until the sarking boards and the roof felt had been laid across the entire roof. 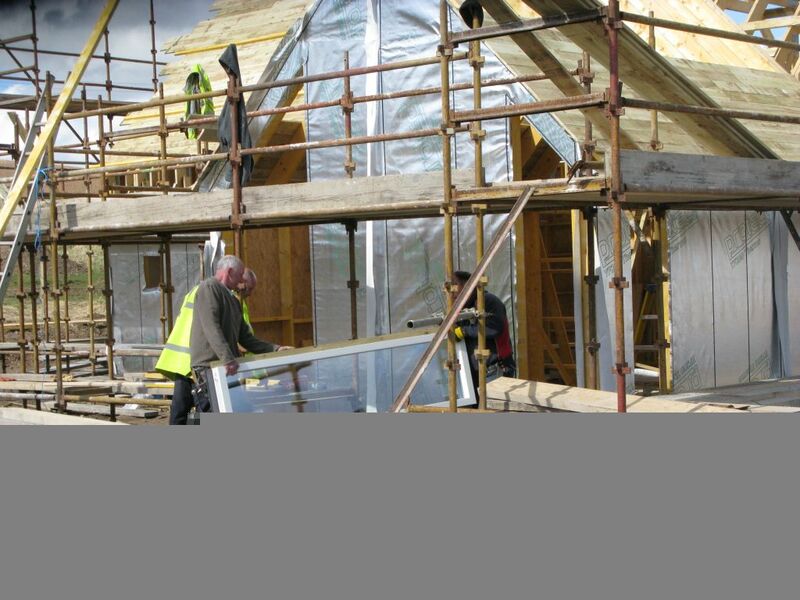 There are thirteen roof lights in all, almost as much glass as roof slates. 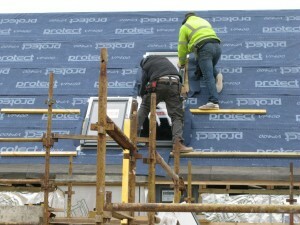 Once the roof light openings were in place, the next job was laying the sarking boards. 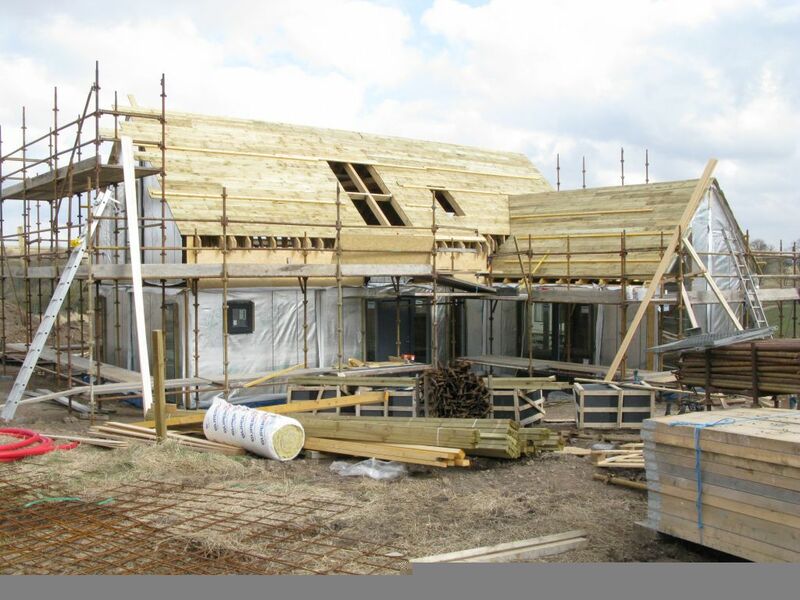 This is one of the Scottish aspects of house building, different from south of the Border. 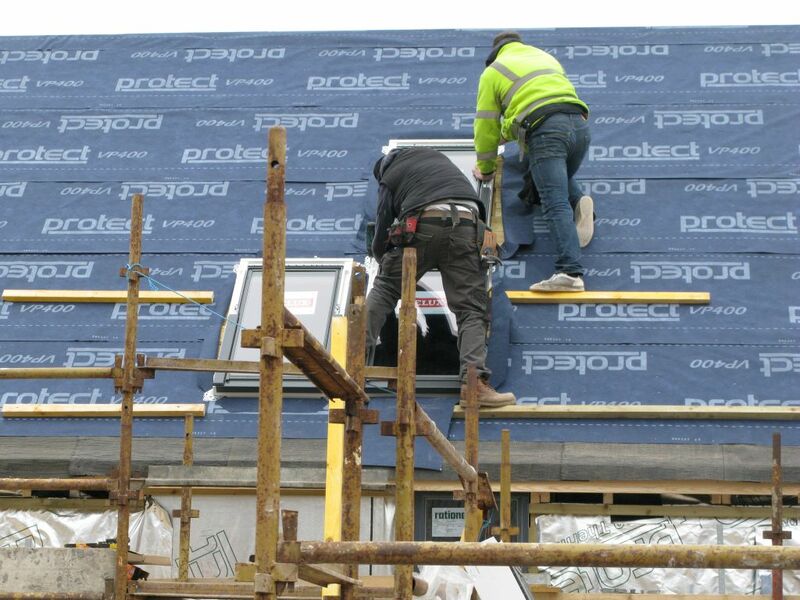 For a tiled roof, individual planks are laid on the roof, fully covering it. Fiddly work, especially around the joins in the two roofs. Next up is felting the roof. Looks easy – roll the felt across the sarking boards, cut it at the end and staple it into place. Rather you than me! But then the roof lights go in. These Velux units come with all the gadgets needed to fit them into a roof. No messing with firestops. And in they slipped, all 12 of them with one left over for next week. Walking in we’re starting to see the light Andy promised us with his design. 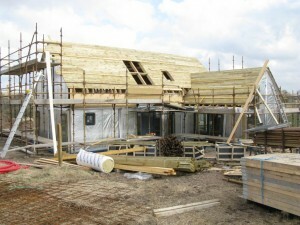 The house is looking wonderful and growing so quickly. 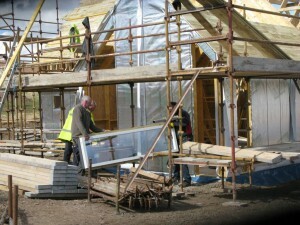 There is going to be so much light and the views from the skylights must be amazing. Look forward to the next stage.